The world would certainly be a better place if people were more like chamomile. It is white and yellow face smiles brightly up, cheering all those who pass by, though it is in no way garish, having a softness and subtlety that could allow it to be overlooked. It has long been associated with humility due to the fact that, when planted in lawns, it grows better the more it is trodden on. In this way it teaches us strength and endurance and the ability to turn difficult circumstances to our advantage. In the Victorian language of flowers it represented patience in adversity. We all know the calming effects of chamomile, much needed in these busy times, as well as its ability to ease the digestion. On an emotional, as well as physical level it can help us to better ‘digest’ and assimilate difficult events or situations. The Chamomile used in olden days to be looked upon as the ‘Plant’s Physician,’ and it has been stated that nothing contributes so much to the health of a garden as a number of Chamomile herbs dispersed about it, and that if another plant is drooping and sickly, in nine cases out of ten, it will recover if you place a herb of Chamomile near it. 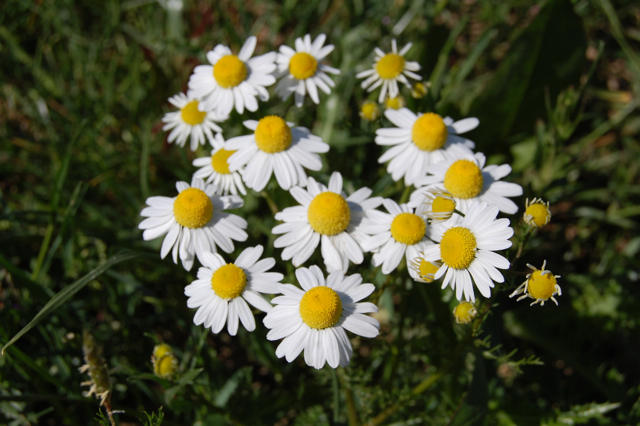 The Chamomile is a true example of what it means to be medicine, completely and fully, so that everything around can benefit from our presence. This surely should be the aim of all healers and herbalists and indeed all people seeking a better world for themselves and other beings. We have been loving the chamomile around here! It has become an afternoon ritual to harvest some flowers for tea. Such a lovely and strong plant.